The Chinese and their Rebellions: Thomas Taylor Meadows on Taiping Warfare and the Emergence of the Traditional Chinese Martial Arts. The Great Seal of the Taiping State. Source: Wikimedia. Introduction: One Post, Two Research Programs. The current post hopes to make a contribution to two ongoing projects here at Kung Fu Tea. The first of these research programs has already led to a number of posts, while the second is a new line of thought that I hope to pursue over the next year. As we have previously discussed, one of the problems with attempting to describe the traditional Chinese martial arts prior to 1911 is that they fell very firmly into the camp of popular culture. While it is an exaggeration to say that they generated no popular literature, it certainly is the case that Chinese historians and public intellectuals did not pay much attention to them. Early foreign language reports on China (usually recorded in English, French, German and Japanese) are valuable precisely because their authors were forced to explain the minutia of daily life. Not all of these authors were particular skilled social observers, or were well enough versed in Chinese culture to be reliable witnesses, but a surprising number were. The reports that these authors filed with their home governments were spared the ravishes of the Taiping Rebellion, the 1911 Revolution, the years of warlordism, the Second World War, the Chinese Civil War and finally the Cultural Revolution. The 20th century was a tumultuous time for China and many important historical documents and photographs were lost. Still, there are a number of other 19th century questions that we have not yet had the time to address. Perhaps the most important of these is the Taiping Rebellion (1850-1864). This massive revolt and civil war consumed much of China’s resources during the middle years of the 19th century. It left the state weakened and less mindful of the movement of Western imperialists on its southern and eastern flank. The conflict, ostensibly religious in nature, but touching on a number of other issues from economics, ethnicity, identity, modernization and social organization, claimed up to 20 million lives. It was the single most deadly civil war in the history of the human race. The Taiping Rebellion is interesting to students of Chinese martial studies for a number of other reasons as well. It was fought at approximately the same time as the American Civil War. The “War between the States” is often cited as the “first modern war,” due to the introduction of such innovations as rifled muskets, highly accurate rifled artillery, cartridge loading repeating firearms and the widespread use of trenches. Still, one suspects that most early observers simply fixated on the fact that many soldiers entered this conflict carrying spears, bows, swords and shields. Further, all of the professional soldiers in both armies were trained in traditional Chinese methods of combat. Many of these privileged individual combat on the battlefield rather than moving and shooting as coordinated military units (a tactic that repeated British victories showed to be far superior). Still, it is easy to carry these notions too far. While historical fiction often romanticized accounts of soldiers carrying “cold weapons,” actual intelligence reports tell a different story. They remind us that both the rebels and the Imperial army carried a large number of firearms with them. It was artillery and musket fire that shaped events on the battlefield. Very often these weapons were of the latest western designs, including the newly invented revolver which was seen in China in great numbers from the 1850s on. Paradoxically the traditional Chinese weapons and fighting arts did not simply vanish as many modernists might expect. Instead they lingered on the battlefield over the course of the long and bloody war. After the conclusion of hostilities these arts seem to have even increased in popularity. While warfare might inspire innovation, the martial arts are essentially social institutions, they actually need a certain degree of peace and stability to develop. Perhaps we should not be surprised that the late 19th century was a time of such growth and innovation in the traditional fighting arts. The country was full of veterans and survivors of the conflict who were now looking for some way to make a living. For instance, the first teacher of the famous internal stylist Sun Lutang was a veteran of the Taiping Rebellion. Many of the practices that people now regard as the “traditional martial arts” either emerged out of, or were reshaped by, the shadow of the Taiping Rebellion. It is ironic then that studies of the development of the traditional fighting systems have so little to say about this vulcan crucible. One suspects that a number of factors are at play. Many historic records have not survived, and the image of the Taipings themselves have been appropriated and re-imagined by successive ideological movements. The “Kingdom of Great Peace” was not particularly popular in late 19th century China where most individuals remembered only the unprecedented scale of death and slaughter that it was responsible for. During the Republic era the Taipings were rehabilitated and shown to be precursors of the nationalist revolution. For the Communist they were early prophets of class struggle against both feudalism’s internal rot and western imperialism. I personally suspect that the degree of violence unleashed in such a short space of years may have triggered that unique series of psychological events described by Ernest Renan in which certain horrors are collectively forgotten so that a new political reality can be retrospectively remembered. Over the course of the next few months I would like to write a number of posts attempting to come to term with Taiping Rebellion and the effect that it may have had on the subsequent development of the martial arts in late 19th century China. The first of these will deal directly with the degree to which traditional weapons and tactics survived on the Chinese battlefield in the 1850s and 1860s. Again, this is one area where western accounts are often quite helpful. Chinese sources have a tendency to ignore the humble foot soldier and focus on larger strategic and political issues. European military observers, on the other hand, took a great deal of interest in the “privates” and “irregulars” of each opposing army, and often described their discipline, training, weapons, manner of dress and even diet in some detail. Of course the Opium War had already happened and future conflicts with the Chinese were expected by at least some observers, so these details were not simply of academic interest. These accounts provide us with an opportunity to combine our discussion of foreign language archival sources and Taiping military history. 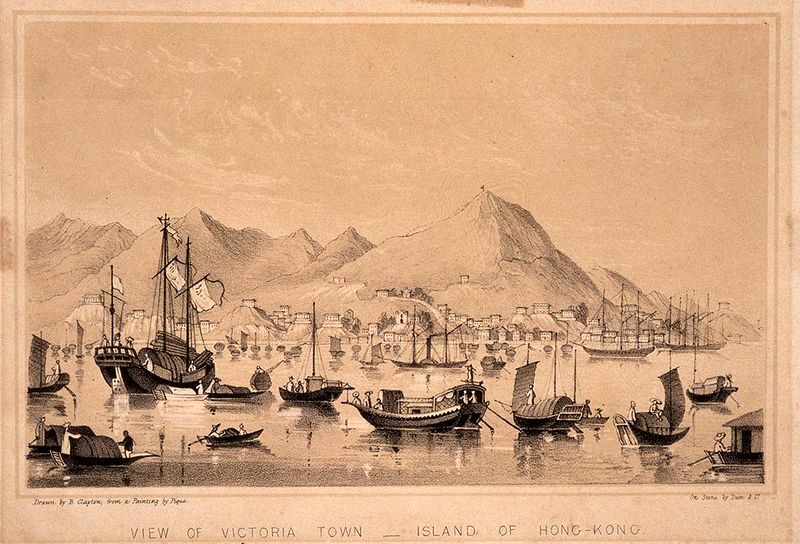 View of Victoria Town, Island of Hong Kong, 1850. Source: Wikimedia. Thomas Taylor Meadows: A Life Less Ordinary. Some lives are so eventful, so truly remarkable, that one actually doubts that they could have happened at all. Note that I am not asking whether these events occurred in a simple historical sense, but whether, on a metaphysical level, it is even possible to pack so much living into so few years. Thomas Taylor Meadows (b. 1815 – d. 1868) was an incredible gifted individual. He was erudite, even by the standards of his day. As an early member of the British diplomatic corps in Hong Kong (and later Shanghai) he had a chance to shape the western understanding of, and policy towards, China. He was also extraordinarily risk-acceptant. A graduate of the University of Munich he studied Chinese with Professor Karl Friedrich Neumann. Less than one year after his graduation in 1842 he arrived in Hong Kong where he would work as a Senior Assistant and later as an Interpreter. Both job titles are nondescript and they conceal the true nature of Meadows’ work. As the “Interpreter” it was his job to secure not just good translations of documents, but the various Chinese letters, gazetteers and confidential imperial reports that the British government might find enlightening in the first place. In modern terms, Meadows was the MI5 “station chief” for the single most important British holding in Asia. He pursued his new calling with zeal. In only a few years Meadows succeeding in building a formidable intelligence organization that was loyal to him personally. Even more impressive is that he did this work basically by himself and he did it the old fashioned way. He got to know Chinese citizens from all levels of society, learned their secrets and ruthlessly exploited them. He knew who was secretly addicted to opium, which upright scholar and pillar of the community had just lost of lot of money on a business deal gone bad and who was vulnerable to blackmail because of a past indiscretion. Any Cold War spymaster would have been proud of his achievements. Even more remarkable is the fact that many of the individuals he recruited into his network of informants turned out to be both loyal and highly motivated. Throughout the 1840s his organization spanned from Hong Kong to Beijing. Nor were his intelligence gather activities always confined to the office. Meadows was known to take to the field on sometimes risky reconnaissance ventures. In 1853, after being transferred to the British Consul in Shanghai, he conducted an extensive survey of the Yangtze delta and the Grand Canal from his own, specially outfitted ship. This was remarkable as with the partial exception of priests, most westerners were not permitted to travel into the Chinese interior. That rule was particularly strongly enforced in the case of intelligence agents. Meadows traveled in secret on a 35 foot former opium ship. The crew consisted of his own captain, cook, secretary and body servant, in addition to five canal-men that were recruited along the way. The vessel was armed to repel pirates and provided Meadows with a safe venue from which he could observe troop movements and the flows of refugees throughout the Chinese heartland. To the extent that Meadows is remembered at all it for two books that he published. The first of these was released in London in 1847, though its preface bears the date of June 15th, 1846. It is titled Desultory Notes on the Government and People of China and on the Chinese Language, and it remains to this day one of the most important foreign language descriptions of this era of Chinese social history. Meadows had a genuine respect for the Chinese people and he was intrigued by certain aspect of Chinese political thought and government. In that sense he more resembles the European thinkers of the previous century who were more inclined to study China’s customs rather than his contemporaries which tended to dismiss anything “Oriental.” Meadows made a genuine effort to impress some of these more important traditions (such as the idea of a universal civil service exam) on his readers. 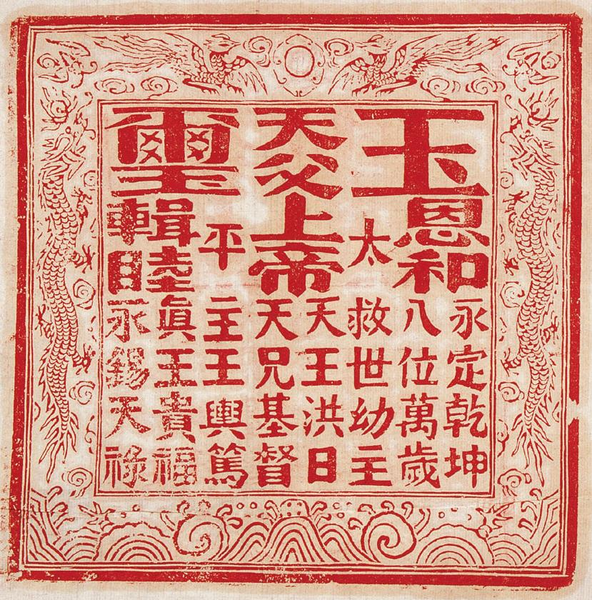 In short, his 1847 volume provides us with a remarkably detailed account of the underside of life in southern China. While he never really addresses martial artists specifically (indeed, to most observers at the time hand combat skills did not define a distinct professional class, rather these were talents spread among the other much more socially meaningful groups), he does describe the world that they inhabited in some detail. Like many “philosophical” 19th century authors Meadows makes no attempt to stay on topic. His writing is characterized by lengthy asides on almost every topic imaginable. I suspect that this makes him a rather daunting read for most modern students. Still, Desultory Notes has much to offer the student of Chinese martial studies. More important still is his 1856 volume, modestly titled The Chinese and their Rebellions, viewed in connection with their national philosophy, ethics, legislation and administration, to which is added An Essay on Civilization and its present state in the East and West (London: Smith Elder and Co. 1856). This work, widely considered his magnum opus, was composed and published while meadows was on sick leave, recovering from a serious illness, in England. Again, the book is remarkable for the scope of topics that it covers. Nevertheless, its main thrust is a study of the early phases of the Taiping Rebellion (then underway) along with some more philosophical ponderings on how western (specifically British) foreign policy in the region may have contributed to weakening of the Qing regime and the wider political and social mechanism’s behind China’s seemingly endless cycle of rebellion. His conjecture that British victory in the Opium War humiliated and weakened the social standing of the central government vis a vis the gentry of Guangdong, thereby unbalancing the local social order, was essentially correct. Further he made this observation almost 100 years before Fredrick Wakeman was able to really back the claim up with extensive archival research (Strangers at the Gate: Social Disorder in South China, 1839-1861. 1966. University of California Press.) Meadows even passed on a few notes about the “Red Turban Revolt” (and the terrible white terror that followed) in Guangdong in the middle of the 1850s which features so prominently in the histories of many southern styles. After returning to the field Meadows was promoted to higher political positions within the Foreign Service. He eventually ended up serving as a consul himself. While his naturally pugnacious and energetic personality had served him well as an intelligence officer who often found himself in the field, it was less of an advantage as a diplomat. Even his admires noted that he was constantly getting in fights. Further, he tended to focus on long terms political planning and political philosophy rather than the immediate concerns of British missionaries or opium merchants. His term as a treaty port consul was less than brilliant. It was also short. His career was ultimately ended by another bout with illness and death at the age of 53. I suspect that Meadows is not better remembered today because of his short tenure as consul. And while his books are often cited, their lengthy and rambling nature insures that few individuals actually take the time to read them. This is a shame as he was a gifted social observer and had a lot to say that is of interest to students of martial studies. Below are two important excerpts specially chosen from his second work, The Chinese and their Rebellions. Both of these works describe in detail the reality of combat in China during the 1850s. The first short passage is an excerpt from the field journal that Meadows kept while on his 1853 expedition up the Grand Canal. In it he discusses his crew, the local piracy situation, and his specific plan for dealing with a possible nighttime assault on his ship. These plans were laid in all seriousness as another of his vessels had been intercepted by pirates ten years earlier and he had been forced to abandon the ship, along with the rest of his crew, after receiving a minor spear wound. It is interesting to note that both the craft under Meadow’s command and the local pirates were armed with a mix of guns and long pole arms (referred to in the text as “pikes.”) One would think that such a long weapon would be of limited use on such a small vessel, but apparently they were the favored traditional means of ship to ship defense. The second passage is even more interesting. In it Meadows describes watching a group of imperial skirmishers engage the enemy at the siege of Shanghai. What he sees is a typical unit of the period made up of soldiers carrying both firearms and traditional “cold weapons.” In the middle of an exchange of musket fire one of the soldiers with a sword and shield takes the opportunity to perform a training form, apparently for the edification of both the Taiping soldiers on the city wall and the assembled civilians who were watching the proceedings from a safe distance. Most of our discussion of the traditional arts in this period has divided them into “practical” exercises that were taught to military professionals intent on killing someone, and “flowery” or “civilian” forms that might have been flashier and better suited to the marketplace or the opera stage. This field report seems to confound our simple expectations. What Meadows observes is that “performance” was not restricted to the opera stage. It was connected to the esprit de corp of the Imperial troops and “war dances” (his term) were common on the battlefield. This is not the first time that readers of Kung Fu Tea will have encountered such an account. Commander J. Elliot Bingham described much the same thing, complete with shouts, jumping about and slashing the air with swords, when recounting the advance of the Guangdong militia in 1842. The description given by Meadows is much more detailed and it is clear in his account (more so that Bingham’s) that this is an elaborate recitation of set movements designed to have a visual impact. The soldiers that he describes are not mercenaries or easily excitable civilian militia members; they are members of the Green Standard Army. When transcribing the passages by Meadows I have attempted to stick as close to the original 1856 text as possible. Modern spellings of place names have been inserted in [brackets] after the original to eliminate confusion. Further, there are practically no paragraphs in the original text. I have inserted modern paragraph break marked with a set of closed brackets  to aid readers. Meadows deserves to be much better known than he currently is. Many of his insights about the nature of Chinese politics and its reaction to imperialism were insightful and before their time. He did not romanticize his accounts of either war or politics and he was a gifted observer. For students of Chinese martial studies he paints a fascinating picture of the ways in which traditional weapons continued to exist side by side with the latest western small arms and artillery. In his accounts martial artists are valued for a number of skills. Sometimes they are recruited as military trainers. Other times they employ their boxing forms as a weapon of esprit de corp. In other situations they were expected to use three meter long spear to defend shipping on the Grand Canal from the very real threat of nighttime pirate ambushes. Meadows does not directly answer the questions of why and how the modern Chinese martial arts arose in the shadow of the Taiping Rebellion. Instead he gives us an interesting description of what the immediate precursor to that world looked like and how the martial arts were used within it. These descriptions could be an important starting point for any subsequent conversation. 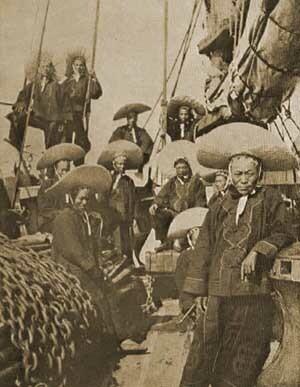 19th century Chinese sailors aboard their vessel. The Chinese and their Rebellions, Chapter XVI “Excursion on the Grand Canal to Obtain Information Respecting the Rebels.” pp. 218-221. “I here told my people how I wished them to act in case an alarm of robbers was given. My head-boatman, body servant Yung shun, and the cook sleep under the matting on the deck in front of my main cabin; which latter is occupied by myself alone, and where are all the arms except the Hermes’ six pikes. In the small aft cabin, separated by the sliding door from the main one and in like manner from the after deck by another sliding door, sleeps my clerk Fang. At the back, on the aft deck, sleep the five hired men. To these men, who profess great valor, cocking up their thumbs in the Chinese fashion and saying of the robbers, ‘Let them dare to come!’ I have entrusted five pikes; with orders either to defend the after deck or to fly to the shore and wait the event there, as they may please; but on no account to come to the front, as I cannot distinguish people at night, and, as soon as arrangements are effected there will fire at every one who shows himself. These arrangements in the front are that the head-boatman, a perfect specimen of a Keang soo coward, shall on the alarm being given instantly throw open the front door, and them make for the shore or the back of the boat as he pleases. Yung shun and the cook are to sit up but to remain in their places before till I call them by name; when they are both to jump into my cabin and go to the back of it. The cook is instantly to hold together the two parts of the sliding door at the back until he has ascertained that the back is secured. Fang is to then remain in charge of the back entrance, attending to nothing else while the cook is to take the sixth pike, placed every night on the floor of my cabin, and be ready to prevent any one bolting in at the front door while I open to fire out at it. Yung shun is to get out the muskets for me and be ready to load them. He is to have one of the bayonets and Fang the other. I have inserted the above [journal entry] at length because it amuses even myself now. It reads a bit of Robin Crusoe’s artillery preparations in his castle to keep off the savages. But my preparations were very serious and very necessary. The paralyzation [sic] of the Authorities had, I knew, given scope to the “savages of civilization,” who abound in the enormous cities of China as in our own; The Chinese regular military, who were moving in considerable number on and near the Canal, were by no means indisposed to do a little robbery at night; and the “Kwang yung, Kwang tung braves [Guangdong mercenaries]” or irregulars, of whom numbers were also on the Canal, were most of them South Eastern pirates by profession. Lastly my five new boatmen, whom I was only to glad to find willing to take me on, were members of the great fraternity of Imperial Grain junkmen, of whom we know from Imperial Statistics that there about one hundred and twenty thousand on the entire length of the Grand Canal, and probably not less than twenty thousand on that very portion of it which I was about to navigate. Now these men, who re either natives of Shan tung [Shandong] or Chih le [Heibe] or members of families originally from that part of China, but themselves natives of the migratory Grain Junks—sons of the Grand Canal, one might say—these men are of notorious turbulence as well as loose notions respecting rights of property. It was quite consistent with their habits, especially in the then position of affairs, to assume the possibility of their concerting with a dozen or two of their comrades to make a night attack on me when they saw that the boat, with her contents, would be no insignificant prize for them. The best plan to ward off this danger altogether was that which enabled me to meet the others, viz., to let my crew know that I was not only resolved to but had deliberately prepared to make a serious defense, no matter what they did. In the mean time they were firing their peculiar combustibles into my boat, and prodding, by such light as these gave, at my ribs with their long spears. The result was that I has to follow the example given by me crew at the earliest period of the proceedings, by throwing myself into the river and swimming to the shore. Several people having been killed who had been taken at a disadvantage in a similar way, I was fortunate in getting off with a wetting and a slight spear wound to one hand; but the affair was provoking, to the least of it, and I solemnly vowed that under no circumstances whatever—not even where was least likelihood of attack—would I ever be again unprepared at night. At present, on the Grand Canal, I had, besides the particular dangers of the time and of the country, considerable reasons to expect a visit from some of my old Kwang tung [Guangdong] acquaintances. 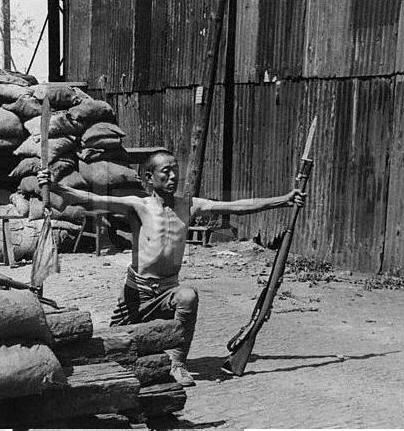 A Chinese soldier performs a sword routine during a later battle for Shanghai, this time in 1937. The Chinese and their Rebellions Chapter III “Miscellaneous Illustrations from Christian and Confucian Civilizations: Some Chinese War-Dancing at the Siege of Shanghae.” pp. 600-603. The artillery of both parties was without exception occidental [western], the ammunition chiefly occidental, and there was a considerable stock of occidental small arms on both sides. The rebels, in particular, had not only a number of muskets and fowling-pieces, but even many revolvers. Here I found a countryman, a merchant, together with some half a dozen long-gowned natives, specimens of the great number of Chinese of respectable station that had been fortunate enough to find a refuge in the foreign location; and who had likewise come so far to look at the fighting. I planted myself with my countryman on the top of one grave mound; the Chinese spectators took possession of an adjacent one about five yards distant. We were about a quarter of a mile from the city wall, between which and us lay a stretch of ground covered with graves, wherein the rival skirmishers were contending. At first we had merely a few stray musket shot singing through the air above us; but the Imperialists presently extended an advanced post of three or four men up a path that crossed immediately in front of our station, in order to prevent the Rebels descending a suburban street that commenced there, and which led off to the left a circuit to the north gate. One man of this small detachment was armed with a match-lock, which he kept firing as fast as he could, up the street at a small party of Rebels; who were returning the fire from the first bend. While loading he kept us, with inflamed countenance and generally indignant air, a fire of abuse at his opponents in which the terms robbers, thieves, &c. were personally the least uncomplimentary. He usually discharged a heavy shot of this kind at them, just before firing his matchlock. Another man, who was armed with a sword and rattan buckler, without being so manifestly angry, was much louder and more voluble in his abuse. He accompanied it with a selection of those curious pranks that the Chinese sword-and-buckler man executes in the course of his parade exercises,-such as springing with his equipments into the air and performing a sword cut and a loud yell when up there; then suddenly squatting down under the shelter of his buckler-in an attitude that stiff joined and tight-breeched European would in vain attempt to imitate-and doing a severe cut from underneath it at the legs of an imaginary foe; then again, placing the buckler, still attached to his arm, on the ground, putting his head on the center and tumbling over, and with it in the direction of his (still) imaginary antagonist; upon whom he has thus made an approach, at once stern-foremost and upside down. In the midst of all this, and perhaps immediately after uttering a fearful yell, he would stop and exchange a broad significant grin with me on the ground. A third man, armed with a long spear only, was equally, perhaps more Chinese, but in a totally different way. He evidentially would have preferred the use of the moral, to the physical agencies in his struggle with the world around him. He took no share in the exertions, muscular and vocal, of his companions; and on my politely asking him to charge up the street and fight the fellows around the corner, he smiled the urbane smile of the pacific reasoning Chinaman and said,-scratching his opposite end the while: “Ta munlae chay le wo ta, puh lae wop uh ta, If they come here I’ll fight, if they don’t, I won’t.” He then leant his spear against the end wall of the first house, squatted down within reach of it, but out of the reach of the street musquetry [sic], and placidly observed the proceedings of his more demonstrative comrades. Our Imperialist friends retired; and if I did not at once follow their example, it was out of curiosity to see what the long-gowned and long-nailed group on the adjoining mound would do. They continued to stand there, screening their faces from the horizontal rays of the declining sun with their fans, and exchanging remarks in a quiet jocular manner. I give this as one of the many instances I have witnessed, completely disproving a stock notion in the Occident about extreme innate cowardice in the Chinese. These were men from the least belligerent part of China. They knew perfectly well what the danger was to which their curiosity was exposing them, inasmuch as several spectators were well known to have been wounded or killed already in the course in the siege. One of the round shot at length grazed the side of their mound throwing the earth over to us, but passing within a few feet only of them. I then said that if they liked to stay here and their heads knocked off they might, but that I was off; only then did they depart. The natives of the Shanghai alluvial plains were perhaps the tamest of the Chinese, yet a few months only after the city had been occupied by the original rebels-men nearly all from the turbulent south-their Chief told me that great numbers of his Shanghae recruits had become just as indifferent to danger, and as good fighters, as his own people. Excellent article Prof. Judkins! I think we’ve already discussed the exploration into the Red Turban Revolt and the Punti-Hakka War in southern China that occurred after the Taiping Rebellion. We you be addressing any connections among the three conflicts? I think the post-Taiping formation of what we characterize as CMA may have a corollary in the post-WWI development and focus on more sedate marksmanship in Western military/law enforcement small arms usage/practice. Interestingly the situation may have been different in Shanghai between the world wars if you believe Fairbairn’s accounts. Looking forward to your continued research and writings. I found your article “A Life Less Ordinary” very interesting. I was researching two books that I am selling that are signed inside by Thos. Taylor Meadows. It will be of no surprise to you that these two books are by William Whewell “The Philosophy of the Inductive Sciences” 1840!